"Pissarro" redirects here. For the surname, see Pissarro (surname). In 1873 he helped establish a collective society of fifteen aspiring artists, becoming the "pivotal" figure in holding the group together and encouraging the other members. Art historian John Rewald called Pissarro the "dean of the Impressionist painters", not only because he was the oldest of the group, but also "by virtue of his wisdom and his balanced, kind, and warmhearted personality". Paul Cézanne said "he was a father for me. A man to consult and a little like the good Lord," and he was also one of Paul Gauguin's masters. Pierre-Auguste Renoir referred to his work as "revolutionary", through his artistic portrayals of the "common man", as Pissarro insisted on painting individuals in natural settings without "artifice or grandeur". Jacob Abraham Camille Pissarro was born on 10 July 1830 on the island of St. Thomas to Frederick and Rachel Manzano de Pissarro. His father was of Portuguese Jewish descent and held French nationality. His mother was from a French-Jewish family from the island of St. Thomas. His father was a merchant who came to the island from France to deal with the hardware store of a deceased uncle, Isaac Petit, and married his widow. The marriage caused a stir within St. Thomas' small Jewish community because she was previously married to Frederick's uncle and according to Jewish law a man is forbidden from marrying his aunt. In subsequent years his four children attended the all-black primary school. Upon his death, his will specified that his estate be split equally between the synagogue and St. Thomas' Protestant church. When Camille was twelve his father sent him to boarding school in France. He studied at the Savary Academy in Passy near Paris. While a young student, he developed an early appreciation of the French art masters. Monsieur Savary himself gave him a strong grounding in drawing and painting and suggested he draw from nature when he returned to St. Thomas, which he did when he was seventeen. However, his father preferred he work in his business, giving him a job working as a cargo clerk. He took every opportunity during those next five years at the job to practise drawing during breaks and after work. 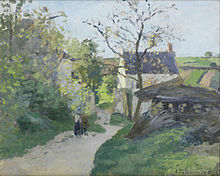 When Pissarro turned twenty-one, Danish artist Fritz Melbye, then living on St. Thomas, inspired him to take on painting as a full-time profession, becoming his teacher and friend. Pissarro then chose to leave his family and job and live in Venezuela, where he and Melbye spent the next two years working as artists in Caracas and La Guaira. He drew everything he could, including landscapes, village scenes, and numerous sketches, enough to fill up multiple sketchbooks. 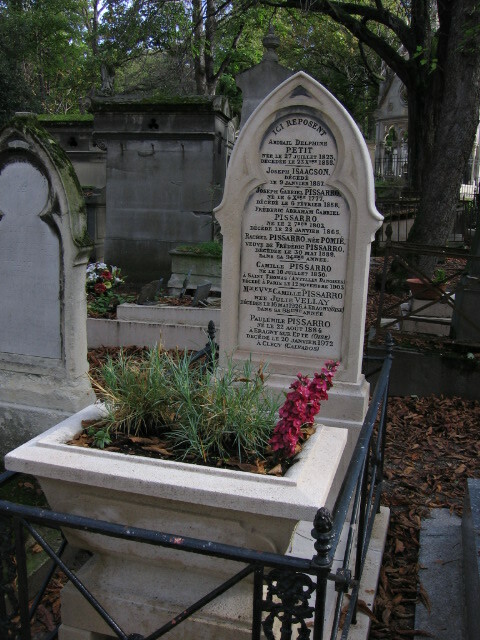 In 1855 he moved back to Paris where he began working as assistant to Anton Melbye, Fritz Melbye's brother. His initial paintings were in accord with the standards at the time to be displayed at the Paris Salon, the official body whose academic traditions dictated the kind of art that was acceptable. The Salon's annual exhibition was essentially the only marketplace for young artists to gain exposure. As a result, Pissarro worked in the traditional and prescribed manner to satisfy the tastes of its official committee. Entrée du village de Voisins, 1872. Musée D'Orsay, Paris. "Work at the same time upon sky, water, branches, ground, keeping everything going on an equal basis and unceasingly rework until you have got it. Paint generously and unhesitatingly, for it is best not to lose the first impression." Corot, however, would complete his own scenic paintings back in his studio where they would often be revised to his preconceptions. Pissarro, on the other hand, preferred to finish his paintings outdoors, often at one sitting, which gave his work a more realistic feel. As a result, his art was sometimes criticised as being "vulgar," because he painted what he saw: "rutted and edged hodgepodge of bushes, mounds of earth, and trees in various stages of development." According to one source, details such as those were equivalent to today's art showing garbage cans or beer bottles on the side of a street scene. This difference in style created disagreements between Pissarro and Corot. In 1859, while attending the free school, the Académie Suisse, Pissarro became friends with a number of younger artists who likewise chose to paint in the more realistic style. Among them were Claude Monet, Armand Guillaumin and Paul Cézanne. What they shared in common was their dissatisfaction with the dictates of the Salon. Cézanne's work had been mocked at the time by the others in the school, and, writes Rewald, in his later years Cézanne "never forgot the sympathy and understanding with which Pissarro encouraged him. ":16 As a part of the group, Pissarro was comforted from knowing he was not alone, and that others similarly struggled with their art. Pissarro agreed with the group about the importance of portraying individuals in natural settings, and expressed his dislike of any artifice or grandeur in his works, despite what the Salon demanded for its exhibits. In 1863 almost all of the group's paintings were rejected by the Salon, and French Emperor Napoleon III instead decided to place their paintings in a separate exhibit hall, the Salon des Refusés. However, only works of Pissarro and Cézanne were included, and the separate exhibit brought a hostile response from both the officials of the Salon and the public. "Camille Pissarro is one of the three or four true painters of this day ... I have rarely encountered a technique that is so sure." And though, on orders from the hanging Committee and the Marquis de Chennevières, Pissarro's paintings of Pontoise for example had been skyed, hung near the ceiling, this did not prevent Jules-Antoine Castagnary from noting that the qualities of his paintings had been observed by art lovers. 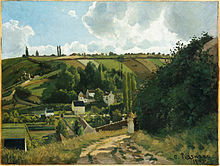 At the age of thirty-eight, Pissarro had begun to win himself a reputation as a landscapist to rival Corot and Daubigny. In 1871 in Croydon he married his mother's maid, Julie Vellay, a vineyard grower's daughter, with whom he would later have seven children. They lived outside Paris in Pontoise and later in Louveciennes, both of which places inspired many of his paintings including scenes of village life, along with rivers, woods, and people at work. He also kept in touch with the other artists of his earlier group, especially Monet, Renoir, Cézanne, and Frédéric Bazille. Bath Road, Chiswick, 1897. Ashmolean Museum, Oxford. After the outbreak of the Franco-Prussian War of 1870–71, having only Danish nationality and being unable to join the army, he moved his family to Norwood, then a village on the edge of London. However, his style of painting, which was a forerunner of what was later called "Impressionism", did not do well. He wrote to his friend, Theodore Duret, that "my painting doesn't catch on, not at all ..."
Pissarro met the Paris art dealer Paul Durand-Ruel, in London, who became the dealer who helped sell his art for most of his life. Durand-Ruel put him in touch with Monet who was likewise in London during this period. They both viewed the work of British landscape artists John Constable and J. M. W. Turner, which confirmed their belief that their style of open air painting gave the truest depiction of light and atmosphere, an effect that they felt could not be achieved in the studio alone. Pissarro's paintings also began to take on a more spontaneous look, with loosely blended brushstrokes and areas of impasto, giving more depth to the work. Through the paintings Pissarro completed at this time, he records Sydenham and the Norwoods at a time when they were just recently connected by railways, but prior to the expansion of suburbia. One of the largest of these paintings is a view of St. Bartholomew's Church at Lawrie Park Avenue, commonly known as The Avenue, Sydenham, in the collection of the London National Gallery. Twelve oil paintings date from his stay in Upper Norwood and are listed and illustrated in the catalogue raisonné prepared jointly by his fifth child Ludovic-Rodolphe Pissarro and Lionello Venturi and published in 1939. These paintings include Norwood Under the Snow, and Lordship Lane Station, views of The Crystal Palace relocated from Hyde Park, Dulwich College, Sydenham Hill, All Saints Church Upper Norwood, and a lost painting of St. Stephen's Church. Returning to France, in 1890 Pissarro again visited England and painted some ten scenes of central London. He came back again in 1892, painting in Kew Gardens and Kew Green, and also in 1897, when he produced several oils described as being of Bedford Park, Chiswick, but in fact all being of the nearby Stamford Brook area except for one of Bath Road, which runs from Stamford Brook along the south edge of Bedford Park. Le grand noyer à l'Hermitage, 1875. The new manner of painting was too sketchy and looked incomplete. Pissarro, Degas, and American impressionist Mary Cassatt planned a journal of their original prints in the late 1870s, a project that nevertheless came to nothing when Degas withdrew. Art historian and the artist's great-grandson Joachim Pissarro notes that they "professed a passionate disdain for the Salons and refused to exhibit at them." Together they shared an "almost militant resolution" against the Salon, and through their later correspondences it is clear that their mutual admiration "was based on a kinship of ethical as well as aesthetic concerns". Cassatt had befriended Degas and Pissarro years earlier when she joined Pissarro's newly formed French Impressionist group and gave up opportunities to exhibit in the United States. She and Pissarro were often treated as "two outsiders" by the Salon since neither were French or had become French citizens. However, she was "fired up with the cause" of promoting Impressionism and looked forward to exhibiting "out of solidarity with her new friends". Towards the end of the 1890s she began to distance herself from the Impressionists, avoiding Degas at times as she did not have the strength to defend herself against his "wicked tongue". Instead, she came to prefer the company of "the gentle Camille Pissarro", with whom she could speak frankly about the changing attitudes toward art. She once described him as a teacher "that could have taught the stones to draw correctly." By the 1880s, Pissarro began to explore new themes and methods of painting to break out of what he felt was an artistic "mire". As a result, Pissarro went back to his earlier themes by painting the life of country people, which he had done in Venezuela in his youth. Degas described Pissarro's subjects as "peasants working to make a living". 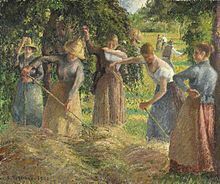 It was Pissarro's intention during this period to help "educate the public" by painting people at work or at home in realistic settings, without idealising their lives. Pierre-Auguste Renoir, in 1882, referred to Pissarro's work during this period as "revolutionary," in his attempt to portray the "common man." Pissarro himself did not use his art to overtly preach any kind of political message, however, although his preference for painting humble subjects was intended to be seen and purchased by his upper class clientele. He also began painting with a more unified brushwork along with pure strokes of color. In 1885 he met Georges Seurat and Paul Signac, both of whom relied on a more "scientific" theory of painting by using very small patches of pure colours to create the illusion of blended colours and shading when viewed from a distance. Pissarro then spent the years from 1885 to 1888 practising this more time-consuming and laborious technique, referred to as pointillism. The paintings that resulted were distinctly different from his Impressionist works, and were on display in the 1886 Impressionist Exhibition, but under a separate section, along with works by Seurat, Signac, and his son Lucien. Pissarro explained the new art form as a "phase in the logical march of Impressionism",:49 but he was alone among the other Impressionists with this attitude, however. Joachim Pissarro states that Pissarro thereby became the "only artist who went from Impressionism to Neo-Impressionism". But the change also added to Pissarro's continual financial hardship which he felt until his 60s. His "headstrong courage and a tenacity to undertake and sustain the career of an artist", writes Joachim Pissarro, was due to his "lack of fear of the immediate repercussions" of his stylistic decisions. In addition, his work was strong enough to "bolster his morale and keep him going", he writes. His Impressionist contemporaries, however, continued to view his independence as a "mark of integrity", and they turned to him for advice, referring to him as "Père Pissarro" (father Pissarro). In his older age Pissarro suffered from a recurring eye infection that prevented him from working outdoors except in warm weather. As a result of this disability, he began painting outdoor scenes while sitting by the window of hotel rooms. He often chose hotel rooms on upper levels to get a broader view. He moved around northern France and painted from hotels in Rouen, Paris, Le Havre and Dieppe. On his visits to London, he would do the same. During the period Pissarro exhibited his works, art critic Armand Silvestre had called Pissarro the "most real and most naive member" of the Impressionist group. His work has also been described by art historian Diane Kelder as expressing "the same quiet dignity, sincerity, and durability that distinguished his person." She adds that "no member of the group did more to mediate the internecine disputes that threatened at times to break it apart, and no one was a more diligent proselytizer of the new painting." According to Pissarro's son, Lucien, his father painted regularly with Cézanne beginning in 1872. He recalls that Cézanne walked a few miles to join Pissarro at various settings in Pontoise. While they shared ideas during their work, the younger Cézanne wanted to study the countryside through Pissarro's eyes, as he admired Pissarro's landscapes from the 1860s. Cézanne, although only nine years younger than Pissarro, said that "he was a father for me. A man to consult and a little like the good Lord." The American impressionist Mary Cassatt, who at one point lived in Paris to study art, and joined his Impressionist group, noted that he was "such a teacher that he could have taught the stones to draw correctly." Caribbean author and scholar Derek Walcott based his book-length poem, Tiepolo's Hound (2000), on Pissarro's life. During the early 1930s throughout Europe, Jewish owners of numerous fine art masterpieces found themselves forced to give up or sell off their collections for minimal prices due to anti-Jewish laws created by the new Nazi regime. Many Jews were forced to flee Germany. When those forced into exile owned valuables, including artwork, they were often seized by officials for personal gain. In the decades after World War II, many art masterpieces were found on display in various galleries and museums in Europe and the United States. Some, as a result of legal action, were later returned to the families of the original owners. Many of the recovered paintings were then donated to the same or other museums as a gift. One such lost piece, Pissarro's 1897 oil painting, Rue St. Honoré, Apres Midi, Effet de Pluie, was discovered hanging at Madrid's government-owned museum, the Museo Thyssen-Bornemisza. In January 2011 the Spanish government denied a request by the US ambassador to return the painting. At the subsequent trial in Los Angeles, the court ruled that the Thyssen-Bornemisza Collection Foundation was the rightful owner. Pissarro's Le Quai Malaquais, Printemps is said to have been similarly stolen, while in 1999, Pissarro's 1897 Le Boulevard de Montmartre, Matinée de Printemps appeared in the Israel Museum in Jerusalem, its donor having been unaware of its pre-war provenance. In January 2012, Le Marché aux Poissons (The Fish Market), a color monotype, was returned after 30 years. 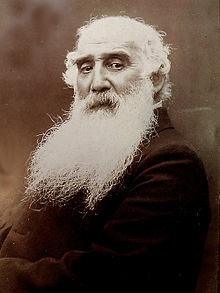 During his lifetime, Camille Pissarro sold few of his paintings. By the 21st century, however, his paintings were selling for millions. An auction record for the artist was set on 6 November 2007 at Christie's in New York, where a group of four paintings, Les Quatre Saisons (the Four Seasons), sold for $14,601,000 (estimate $12,000,000 – $18,000,000). In November 2009 Le Pont Boieldieu et la Gare d'Orléans, Rouen, Soleil sold for $7,026,500 at Sotheby's in New York. In February 2014 the 1897 Le Boulevard de Montmartre, Matinée de Printemps, originally owned by the German industrialist and Holocaust victim Max Silberberg (de), sold at Sotheby's in London for £19.9M, nearly five times the previous record. Camille's son Lucien was an Impressionist and Neo-impressionist painter as were his second and third sons Georges Henri Manzana Pissarro and Félix Pissarro. Lucien's daughter Orovida Pissarro was also a painter. Camille's great-grandson, Joachim Pissarro, became Head Curator of Drawing and Painting at the Museum of Modern Art in New York City and a professor in Hunter College's Art Department. Camille's great-granddaughter, Lélia Pissarro, has had her work exhibited alongside her great-grandfather. From the only daughter of Camille, Jeanne Pissarro, other painters include Henri Bonin-Pissarro (1918–2003) and Claude Bonin-Pissarro (born 1921), who is the father of the Abstract artist Frédéric Bonin-Pissarro (born 1964). ^ a b Hamilton, George Heard (1976). "Pissarro, Camille". In William D. Halsey. Collier's Encyclopedia. 19. New York: Macmillan Educational Corporation. p. 83. ^ Wold Eiermann, "Camille Pissarro 1830–1903," in Christoph Becker, Camille Pissarro (Hatje Cantz: Ostfildern-Ruit, 1999), 1. ^ "Exhibition". St. Thomas Synagogue. Archived from the original on 25 March 2010. Retrieved 5 October 2010. ^ "Road to Versailles". The Walters Art Museum. ^ King, Ross. The Judgement of Paris, Chatto & Windus (2006). p. 230. ^ Seaton, Shirley (1997). "Camille Pissarro: Paintings of Stamford Brook, 1897". Brentford & Chiswick Local History Journal. 6. ^ For more details of his British visits, see Nicholas Reed, Camille Pissarro at Crystal Palace and Pissarro in West London, published by Lilburne Press. ^ Mathews, pp. 139, 149. ^ Mathews, pp. 190, 238–9. ^ "'Doubting Thomas' -- review of Derek Walcott's Tiepolo's Hound". Retrieved 27 April 2015. ^ "U.S. District Court confirms Thyssen-Bornemisza Collection Foundation of Spain as owner of artwork"
^ "BBC News - Pissarro painting sells for a record £19.9m". Bbc.co.uk. Retrieved 6 February 2014. ^ "Hunter College Performance Goals and Targets 2008–2009 Academic Year" (PDF). Hunter College, CUNY. 18 June 2009. Retrieved 15 June 2013. ^ "Christina Gallery expands its post-Impressionist collection". MV Times. 30 July 2014. Retrieved 5 September 2017. Mathews, Nancy Mowll (1994). Mary Cassatt: A Life. New York: Villard Books. ISBN 978-0-394-58497-3. LCCN 98-8028. 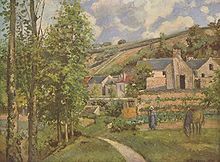 Wikimedia Commons has media related to Camille Pissarro. Wikisource has the text of the 1911 Encyclopædia Britannica article Pissarro, Camille.